Our battery clips, contacts & holders are designed with leading edge technology in mind, to accommodate all major manufacturers’ batteries. Available in a wide range of materials and mounting styles including SMT, THM & off board. Some of the applications include : Telecommunications, memory hold, emergency power systems, personal medical monitoring devices. Battery Holders with PC Connector Plug. For “AA”, “AAA”, “CR2”, “12V” and “N” Cells – One to Four Cell Designs. PC Connector is added to end of 6″ wire leads. This allows for a quick connection of the battery pack to circuitry. PC Connector Jacks available for connection to circuit board. • Vertical or Horizontal entry. • SMT or THM mounting. • Material: Polypropylene base, Densi-Pak: ABS base. • Nickel plated steel springs. • Wire Leads: 6.0″ [150.0] long, 26 AWG, UL/CSA 1007. • Connector Nylon 6/6 UL 94-V0. • Multi cell holders are wired in series. For “AA” , “AAA” & “9V” Cells. Available for up to 3 cell Designs. 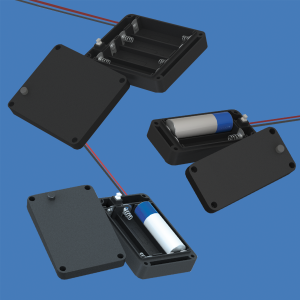 Molded from impact resistant A.B.S., these self-contained battery holders can be placed on or off a board, between components or anywhere within the case where space is available. In addition to portability, these devices feature coil contact springs to compensate for variations in battery length and to securely hold batteries in place, assuring positive low contact resistance connections. These devises also feature snap-on covers to protect batteries and an added screw to increase resistance to shock and vibration. For safety, holders are constructed with fully enclosed contacts. Supplied with black & red 15.24cm long wire leads. Wires are #26AWG and come tinned with 4,75mm stripped ends. PCB Plastic Battery Holders / Sleds. For 18650 Lithium-Ion Cells, with built-in PCB protection circuits. Thru-Hole, Surface Mount and Solder Lug Configurations. Designed for the demands of securing the higher energy density and lower weight rechargeable 18650 Lithium-Ion Cells with built-in PCB protection circuits. Keystone’s holders are specifically engineered to withstand the rigors of abuse and recharging cycles associated with the 18650 Lithium-Ion cell usages. Keystone’s new battery holders are ideal for 3.7 volt, high energy, lower weight mobile electronics, industrial and telecomm applications that have circuit protection to prevent battery damage. Holders feature snap-in PC contacts which assure stability during wave soldering. These low profile, space saving holders are clearly marked with polarity identification to assure proper orientation. The bodies are molded from UL 94V-0 rated plastics. Contacts are 0.012″ (0.30mm) thick Spring Steel with Tin Nickel plating or Phosphor Bronze with gold flash plating. Optional snap-on, molded PBT UL 94V-0, tamper proof covers which help protect against severe shock, vibration and shorting potential are also available. • Thru-Hole, Surface Mount and Solder Lug configurations. • Snap-In PC contact holds in position for wave soldering (THM). • Tin-Nickel Plated contacts for excellent soldering (THM & Lug). • Gold Flash for outstanding solder performance (SMT). • Polarity clearly marked for orientation. • Low Profile, space saving Keystone also offers holders for “1/2AA” ;”AA”; “AAA”;”2/3A”; “1/3N” type batteries. Premium, Economy and Shielded Designs – Available in “T” or “I” Styles. Shielded battery straps incorporate a shrouded housing to protect 9 Volt battery contacts by insulating and shielding them. The shrouded straps prevent tampering and keeps the battery contacts from coming in contact with other conductors. The unique design also protects the battery contacts from dust, dirt, contamination and physical damage. Competitively priced to suit most product application needs. They are available in either “T” or “I” styles. Economy straps are fully insulated and are manufactured with brass, nickel plated contacts and a vinyl coated base. Button, Leaf Spring and Coil Spring Battery Contacts. For PCB and Molded Case Applications. 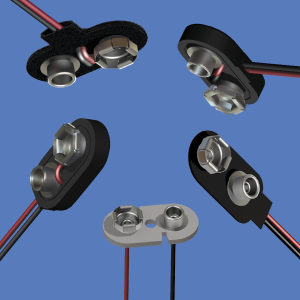 Contacts will provide a reliable connection while maintaining a low contact resistance. Economical contacts are designed to “slide-in” to the battery compartment of electronic equipment. Coil spring contacts are designed with a unique spring tension ability and they accurately adjust to variations in battery length. 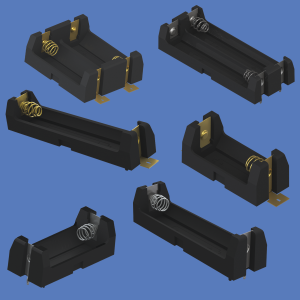 Economical and reliable battery contacts, consisting of leaf spring, coil spring and button type designs, is ideal for use with electronic products having molded-in battery compartments. Button and Spring contacts are ideal for top-side board mounting in PCB packaging applications. Supplied in Bulk or on tape and reel. Lithium Coin Cell Battery Holders. Thru Hole Mount (THM) & Surface Mount (SMT) available for 12mm, 16mm, 20mm, 23mm, 24mm and 30mm Dia. cells. These holders are manufactured from UL rated 94V-0 materials. Contacts made of high quality spring steel to assure reliable connections and allow contact resistance. Each contact is clearly marked with its polarity to assure proper battery insertion. 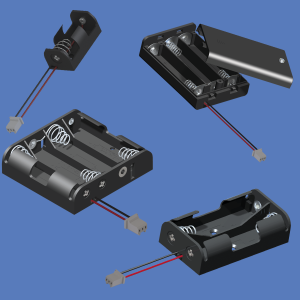 Lightweight and rugged, these PCB coin cell holders offer uniquely designed notched battery slot that assures quick and easy insertion and replacement of all major battery manufacturers’ lithium coin cells. • Low profile for high density packaging. • Reliable spring tension contacts assure low contact resistance. • Retains battery securely to withstand shock and vibration. • Rugged construction, light weight. • Compatible with vacuum and mechanical pick & place systems. • Base material UL rated 94V-0. Impervious to most industrial solvents. • Clearly marked polarities to help guard against improper insertion. • Duracell, Eveready, Panasonic, Ray-O-Vac, Sanyo, Varta, Toshiba, Seiko and other major battery manufacturers. • Computer memory, power transfer and back-up systems. • Video and telecommunications power back-up. • Preprogrammed video and electronic games. • Microprocessors and Microcomputer memory hold. • Notebook and lap top applications. • Industrial and commercial security and alarm systems. • Miniaturized battery power devices. PCB Lithium Coin Cell Battery Retainers. Thru Hole Mount (THM) & Surface Mount (SMT) available for 4.8mm,6.8mm,11.6mm, 12mm, 16mm, 20mm, 23mm and 24mm Dia. cells. Designed for memory back-up and stand-by applications, these contacts permit quick and easy coin cell replacement and installation. Eliminating “soldered-in” cells, computer, video, telecommunication and similar PCB based product users now have a reliable, “no tools required” method for changing batteries. Extremely economical, these retainer contacts are available in surface mount (SMT) or thru hole mount (THM) styles for 4.8mm, 6.8mm, 11.6mm,12mm, 16mm, 20mm, 23mm and 24mm coin cells. The THM version has stable mounting legs for excellent board retention during wave solder. 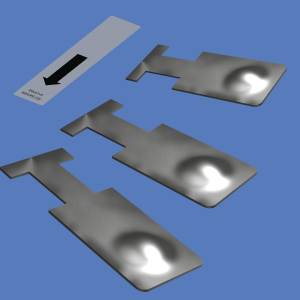 The SMT version includes a unique solder tail “flow-hole” design to bolster reflow and strengthen solder joints. They are manufactured from phosphor bronze, precision stamped and are plated with either a high luster nickel finish or matte tin finish ideal for low temperature soldering enviornments. Both feature dual spring contacts to assure reliable connections and a low contact resistance. Balanced and light weight for pick up and placement, these contacts are compatible with vacuum and mechanical assembly systems. The SMT version is available on tape and reel and the carrier tape is conductive polystyrene which meets the ANSI/EIA – 481 standard. Also Available are Optional Negative Bottom Contacts in both Thru Hole and Surface Mount Styles. Thru-Hole Mount or Surface Mount. Low profile for densely packed PCBs Retains cell securely, withstands shock & vibration Reliable dual spring contacts assure low contact resistance soldering & reflow operations Stable thru mount legs for increased strength Balanced & lightweight for reliable pick up & placement vacuum and mechanical pick & place systems “Flow-Hole” SMT solder tail design for increased joint strength Viewable solder tails assures reliable joint inspection Carrier tape is conductive polystyrene which meets the ANSI/EIA – 481 standard. Universal “Off-Board” Mounting Battery Contact. For “AAA” “AAAA” “N” “12 Volt” Cells. This Universal “Off-Board” PC Battery Contact, p/n 230-1, designed for “AAA”, “AAAA”, “N” and “12 Volt” cells is especially useful and practical. The symmetrical design allows this contact to function both as a positive and negative contact, eliminating the need to specify and inventory two different parts. This contact is manufactured from .008 (0.20mm) thick Spring Steel and is Nickel Plated for corrosion protection, flexible contact and low contact resistance. p/n 230-1 is designed to free-up valuable board space by permitting “Off-Board” edge mounting that affords both reliable connection and easy access to install and replace batteries. Perfect match with our battery insulator (pull tab) p/n 117. High Performance – Coil Spring Battery Holders. High Performance Polarized PCB Plastic Battery Holders. For 1/2AA, AA, AAA and CR123A Cells. Coil Spring Contacts assure proper polarity. Available in Surface Mount (SMT) and Thru Hole Mount (THM) Versions. 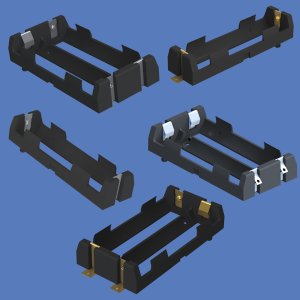 A new selection of polarized SMT and THM Battery Holders for cylindrical batteries. The coil spring contacts, a principal design feature, assure proper polarity and tension on the installed battery. Equipped with heat resistant Nylon housings, the entries are suited for traditional soldering and reflow processing. Surface Mount types feature Gold-plated Stainless Steel contacts assuring low contact resistance and superior solder joints where lead-free soldering or reflow processes are employed. Thru-Hole Mount versions are equipped with Stainless Steel contacts. Retaining covers available for additional battery security. Gold Flash over Stainless Steel for outstanding solder performance. Nickel over Stainless Steel for superior soldering. Snap-in PC contacts hold firmly during. • Specifically designed to firmly retain cylindrical batteries. • Bodies are molded from UL 94V-0 rated plastics.